Oh boy, the days are passing by so quick now. We only have 18 days left and we will be flying back to the mainland. It would be a long and arduous flight of approximately 16 hours. But anyhow, this photo was taken when I was a 5th grader. Can you tell which one is me? I think it is obvious hehehe. Join us in having fun reminiscing the pre-digital photos that we have in our albums. Just click the badge below to visit Ms. Alicia's page. It's not obvious. 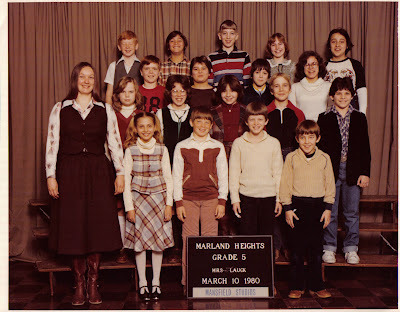 I can't find you, come on tell us which one is you :-) But I'll make a guess - extreme right, front row? hello! thanks for the visit! nice FPF :D so which one are you? are you the one on stripes? im not sure... im just guessing! That brought flashbacks for myself! Those are like my old school pictures!! And that is a great scan! oh, how time flies right? hey...the 70s/80s in full swing...what a great photo...have a great day! Cute class photo... I can't tell which one is you, but I do remember those styles...and I don't miss them! great old photo for memories. I found you!!! Are you in the second row in the center, wearing burgandy? The boy in the red shirt with the numbers? ?